Five Cardiff Fire players in the penalty box. Cardiff Fire return to ice hockey action this Saturday when Romford Raiders are visitors to the Viola Arena in Cardiff Bay (6.30pm). Captain Alan Armour and his Fire team won a bruising, physical battle 7-3 against Swindon Wildcats in their last fixture despite having Swedish defenceman Viktor Langseth thrown out on a match penalty for slashing. 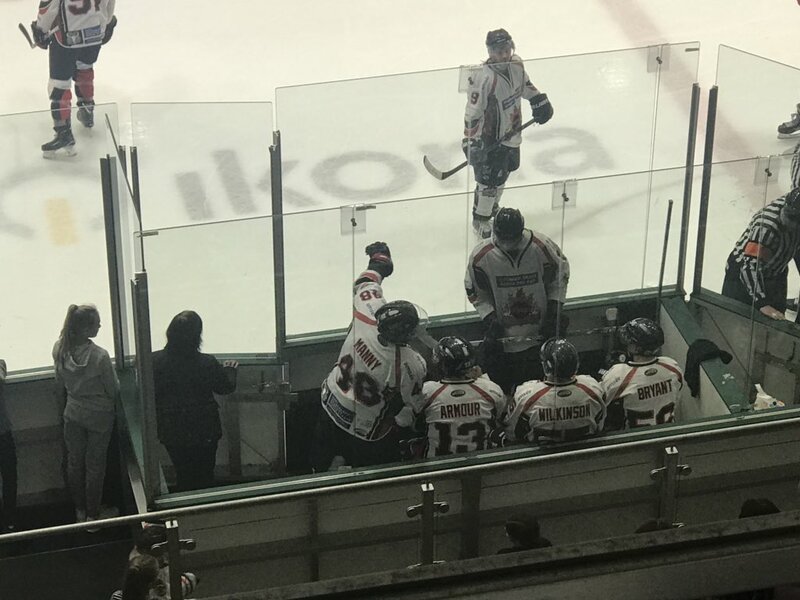 Wildcats had goalie Tyler Perrer dismissed for misconduct after being awarded a 2+2 penalty for roughing, while Fire had five players in the penalty box at one stage. Stephen Dixon (2), Tamas Elias (2), Joe Morris, Ellis Sheppard and Jordan Powell scored for Fire in their National League South win against Wildcats, who then played Romford last weekend. Raiders won 5-3 with Tommy Huggett (2), Brandon Webster, Clint Walton and Ewan Hill scoring. Fire have made their presence felt in the National Ice Hockey League this season, winning three successive matches at one stage and playing with an aggressive and physical edge. Visitors Romford Raiders include two young female players in their team. Abbie Sylvester, whose brother Jake plays for Division One Raiders, and Ellie Wakeling are both Great Britain junior internationals. Sylvester also plays for Bracknell Queen Bees in the women’s Elite League and Chelmsford Cobras in the Premier League. Wakeling, aged 16, has played 12 fixtures this season, three each for the London Raiders NIHL team, Raiders under-18s, Bracknell Queen Bees and Chelmsford Cobras. Saturday 1: Solent Devils v Oxford City Stars, Lee Valley lions v Bristol Pitbulls, Bracknell Hornets v Slough Jets, Peterborough Phantoms v Invicta, Cardiff Fire v Romford Raiders. Sunday 2: Guildford v Solent Devils, Romford Raiders v Basingstoke Buffalo, Swindon Wildcats v Chelmsford Chieftains. Saturday 8: Solent Devils v Haringey Huskies, Invicta v Bracknell Hornets, Slough Jets v Guildford.